Jessica Elliot will release new songs, cites church in Estacada as a formative experience. Musician Jessica Elliot will embark on a tour through four states this summer, but she's equally happy singing during worship at Estacada Community Fellowship. "Being on stage is fun and I get to be a character and help people just relax and let go of their week. Church is a whole different reason for singing," she said. "To be able to have both of those and blend them (is great). There's times where I get to sing spiritual songs in a bar. It just kind of depends on the moment." Elliot, who performs under the name Jessie Leigh, released her first album in 2016. This year, she will release three new singles. The first of the trio, "Storm in May," will be available for streaming April 23. "Irresistible" will be available shortly before the start of summer, and "Mr. Right" will be released during the latter half of the year. "Storm in May" is about falling in love unexpectedly. "I paralleled getting caught in a spring storm. (It's) a cool analogy for when you fall in love, and you're not really prepared for it and it just takes you off guard," Elliot said. She described "Irresistible" as a twist on an "angry lady song." "It's switched and it's all about the crazy girl and the guy who puts up with her. It's more of a positive spin on 'even when I'm unbearable, he thinks I'm irresistible,'" she explained. "It's a little bit different than the standard angry lady songs that are out there right now. They're so angry and kind of guy bashing, and there are good guys out there." And "Mr. Right" is a collaboration with fellow musician Trevor Tagle that chronicles experiences in the dating scene. "It's being super jaded about dating, and just being over all of it," Elliot said. Once the three singles are released via streaming, Elliot will release them on a physical EP, tentatively titled "Irresistible." "All three (songs) have such a different feel and vibe," she said. "I love all of them so much, I wanted to release them as singles to give them their own time and attention rather than just doing a whole album." Comparing the upcoming songs to those on her debut album "Jessie Leigh," Elliot said the new music is "a little more focused on the story rather than the big musical production of it." Reflecting on her career so far, Elliot credits the Estacada community with allowing her to build the confidence to pursue music full time. "I always felt like no matter what stage of my life or my voice, there was such support," she said. "I felt like they believed in me when I didn't." Though Elliot has always been passionate about music, singing in front of large audiences didn't initially come naturally to her. "My freshman year of high school I tried to sing the National Anthem at my soccer game and absolutely choked, and was devastated," she said. "But I couldn't not get back on stage. I was terrified and had horrible stage fright after that, but I couldn't not do it. . .even though I knew that it was going to make me ill and sick to my stomach." Elliot credits Estacada Community Fellowship in particular with building her confidence. "At church I would have people (ask) 'Why are you not singing? We know you can sing.' When I had graduated high school and wasn't doing so much music, that constant support of people who knew my history and knew my love for music helped always bring me back to music," she said. When they needed a worship leader, they encouraged Elliot to take the position. "Even though I hadn't been singing much the last few years they (said), 'We don't care if you know how to play the guitar or don't, or if you mess up. Just lead us,'" she said. "And so getting on stage every single week and knowing that I was going to mess up and that was ok, and and my music could still reach people, was what took me from loving music but being terrified and not being able to do it full time because I couldn't function on stage. It was the first time in my life that I really got through that." She added that the church's close-knit atmosphere was particularly valuable. "I could have been at a church or in another city where nobody knew that I even sang, but these people knew me from when I was little and had seen the love for music," she said. One of the highlights of Elliot's career thus far has been playing at the Estacada Timber Festival in 2015. She described the experience as "a dream come true" and recalled being "a little girl going to the Timber Festival and just seeing this stage and wanting to be there, and not having any idea how to start or that it was even in the realm of my future." "Then to get to be there in my hometown on this stage that I had looked at so many times. . .definitely was a full circle moment for me," she said. This summer, Elliot will travel through Oregon, California, Nevada and Washington on tour. 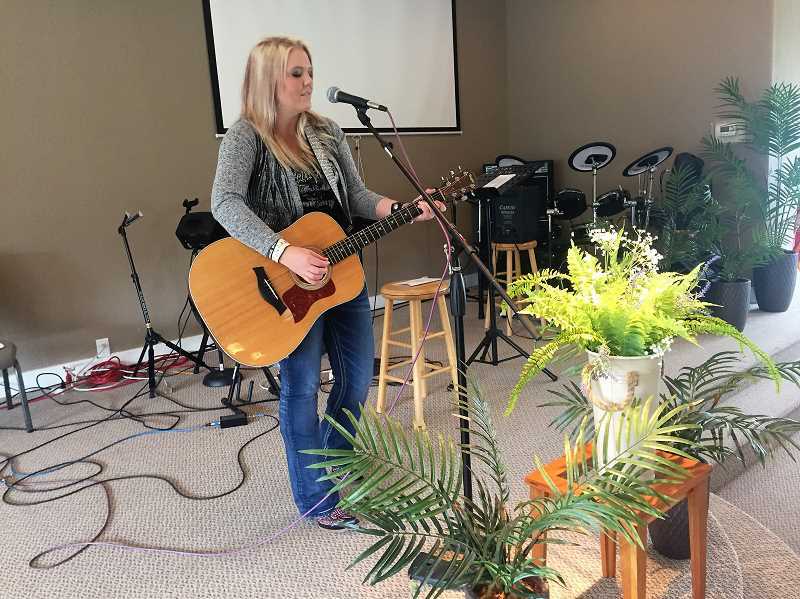 When she's in town, she still leads worship at Estacada Community Fellowship. Elliot appreciates being able to meet new people and promote positivity through music. "There's a little girl I met at a show last year. She's paralyzed and she loves music," Elliot said. "I've visited her a few times at home, and at the Oregon Jamboree, which is kind of home turf for her, I had the crowd scream 'We love Mackenzie.'. . .I try to infuse things like that, because I think it's a really vital part of being put in this position," she said. Though Elliot's music career has taken her to many places, her hometown remains highly significant. "In the end, when all the craziness and the lights are gone, this is what I'm going to be coming back to. There are still my roots and this is what's important," she said.